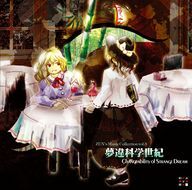 Changing Dreams in the Age of Science ~ Changeability of Strange Dream (夢違科学世紀　～ Changeability of Strange Dream, Yumetagae Kagaku Seiki ~ Changeability of Strange Dream) is an official doujin album by Team Shanghai Alice released on 2004-12-30. The CD is the third volume of "ZUN's Music Collection". Besides three original tracks, it holds arrangements from Embodiment of Scarlet Devil, Perfect Cherry Blossom, Immaterial and Missing Power, Imperishable Night and Shuusou Gyoku. --Is it dream or reality, a good dream or perhaps a nightmare? Two young female mediums, changing future nightmares into sweet dreams. The Sealing Club's club activity journal music CD. ↑ Prayers or rituals to prevent a bad dream from coming true. ↑ 華胥の夢 (Kasho no yume lit. "Dream of Paradise") refers to a story about the Chinese Yellow Emperor who visited a legendary land named Huaxu Country (華胥国) in a dream. The land is said to be utopian, idyllic place or state where there are no rules, where people have no desires and where people don't fear death. Huaxu is very similar to the concepts "Shangri-La" or "Arcadia". ↑ Translated synopsis from ZUN's music cd page.